A looming atrocity in Iran. Sakineh Ashtiani was mistakenly reported to have been released from custody earlier this week—before this print magazine article went to press. Though pictures of her at home appeared on Iranian television, the network subsequently stated that she had been brought there “to recount details of the killing of her husband at the crime scene”—in what might be regarded as a forced confession. As far as can be ascertained, she is still being held by Iranian authorities. I know only a little about Sakineh. I know she was born into a poor and pious family in Osku, a town in the northwest of Iran, where women wear the hijab. I know she was a teacher in the town’s kindergarten, a very small school for children between two and seven, where the teacher does everything: takes care of the children, oversees the canteen where they eat, is a nursemaid for the little ones, and, for the older children, teaches them the rudiments of reading, arithmetic, drawing, and religion. I also know—as the rest of the world does—that Sakineh has been sentenced by an Iranian court to be stoned for the crime of adultery. 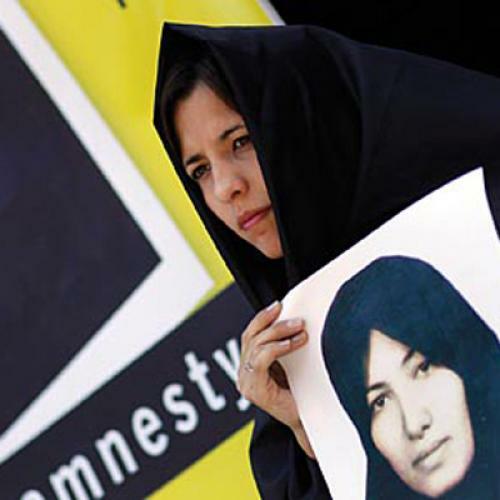 Convicted in 2006, Sakineh was initially sentenced to be whipped. Subsequently, she was sentenced to be stoned. Then, as she awaited her execution, the Iranians decided several months ago that she had not only cheated on her husband, who died in 2005, but murdered him as well. As I have looked into her case, I have learned a few more things. She is Azeri, born in Iranian Azerbaijan, where people are very attached to local culture and few speak Persian. She was certainly literate in Azeri—which fits perfectly with the photo of her that Iranian friends sent me, where she is in the middle of her class, surrounded by little students who seem to adore her—but not in Persian. This explains why she did not understand her sentence of stoning when a judge had her sign it in 2006. Moreover, when the sentence came down, when the representative of the five mullahs who, three against two, judged her to be guilty of adultery, roared the fatal word “stoning,” it was not even in Persian, but in Arabic. And so Sakineh, uncomprehending, signed the statement and then cheerfully went back to the patrol wagon that would return her to prison. She believed that she had been acquitted. All the way back, she hummed, between her two guards, because she thought the judges had understood that she was an ordinary woman leading an ordinary life, wrongfully accused of adultery—and that they would release her without delay. And it was only once she had returned to cell number four, the cell reserved for those condemned to death, that—in circumstances related by one of her cellmates, Shahnaz Gholami, the only political prisoner in the cell—she realized what was really waiting for her: not just death, but the very worst of all deaths. Not hanging, but death by bombardment with stones, the death reserved for adulterers. None of her cellmates dared to clear up the misunderstanding, to drag her out of her waking dream and tell her that she would be buried alive, her body enveloped in a shroud, with just her face above ground, so that the horde of males could easily riddle her with stones. It was a jailer, sadistic and triumphant, who told her. Upon learning the truth, Sakineh immediately fainted. And her comrades had to carry her to one of the four beds prisoners with seniority usually reserve for themselves. I know Sakineh has a mother who, before her daughter was isolated from her companions in misfortune and placed in solitary confinement, came to see her every two or three weeks, bringing her news of her little charges. I know she has a son, Sajjad, the apple of her eye, a ticket-taker for a bus company, who had organized her defense—until one day two months ago when a squad of paramilitaries charged into the office of her attorney, Houtan Kian, in the midst of an interview with two German journalists, and took him away, along with the attorney and the journalists, to a place that remains, to date, unknown. I know she has a daughter, Saeedeh, but apart from her face, long and a bit sad as she stands pressed against her mother in the class photo, I know nothing of her—except that she is now 17, that Sajjad was the one who took care of her, and that, since her brother’s arrest, she is alone in this world and without means. I know Sakineh is a loving mother, concerned, like all mothers, with sparing her children the worst, and that when, four years ago, she was dragged to a boiler room for the first session of 99 lashes with a whip (there would be another, last summer) in the name of sharia, she suffered terribly, of course, from the whip itself, the metal cable biting into her skin and turning it to ribbons, the pain that shot from the base of her back to her head, making her vomit—but she suffered even more from the fact that, according to the rules, the ordeal took place before the eyes of her son, then a teenager. Worse still, I know that today, her resistance and her will exhausted, stuffed with the neuroleptics Sajjad managed to bring her before his arrest, desperate and almost resigned, even if the prospect of her scheduled stoning fills her with horror, and even if she sometimes rubs her eyes with her fists like a child to wipe away the overflowing tears, she asks only one thing of her executioners and, if they are deaf to her pleas, of God: that—for pity’s sake!—Sajjad and his little sister Saeedeh be spared this new spectacle of humiliation and horror. I also know that Sakineh is pious. I have been told of her embarrassment and shame, the day the sadistic jailer spoke and she fainted, when, coming to her senses, she noticed that, in falling, she had let her chador slip off. By all accounts, she is staggered by the unfathomable injustice of which she is the victim, but not really outraged, for she places her destiny in the hands of the Almighty. I know as well—I see it in the other photo, the one best known, where one can see her Madonna’s face framed by two black panels of her chador, clearly outlined—that she is beautiful, very beautiful, although, it seems to me, not so very conscious of the fact. I know as well that the charges against Sakineh seem unlikely to be true. First, there is the matter of her husband, bank employee Ebrahim Qaderzadeh, who died in 2005. Local officials have tried to attribute the killing to her by claiming she injected him with an anesthetic substance before his cousin, Issa Taheri, dragged him into the bathroom to electrocute him with the help of a friend. But Iran has been absurdly inconsistent about the murder, altering the charges in a way that seems calculated to respond to international outrage over the adultery conviction. Moreover, Taheri already confessed to full responsibility for his crime, and is, by the way, now free. But then, as for the adultery? Is it unthinkable that Sakineh was attracted either to the cousin or—for the accusation is so cloudy and seems to have been so methodically tampered with, one ends up getting lost—to the brothers Ali and Nasser Nojoumi, who were apparently not involved in the murder at all? From the accounts of both Shahnaz Gholami, in whom she confided, and Mina Ahadi, president of the International Committee Against Stoning, we know that relations with her husband had deteriorated; he had forced her, for example, to quit the teaching job she was so devoted to, and that seems to have represented to her a humble guarantee of her tiny share of freedom. Might she have nurtured a sort of resentment, and would she not have been tempted, like so many other women in similar situations, to open her heart to another? What then? I questioned Houtan Kian, Sakineh’s attorney, a few weeks before October 10, when he was arrested along with Sajjad. He finds the very idea of adultery in a small town like Osku, where everyone is interested in everyone else’s business, scarcely conceivable. I asked Mohammad Mostafaei, her former attorney, who had to flee Iran, abandoning his practice and crossing the Iranian-Turkish border clandestinely, on horseback and then on foot. Yes, he gave me to understand on the evening of his arrival in Oslo, things hadn’t been going very well within the couple. It appears that Sakineh, at the end of her tether, had even considered divorce, but Iranian law only allows women to divorce in very special cases, such as if the husband is insane or a drug addict or incapable of meeting the household’s needs. She did not succeed and probably felt increasingly bitter about it. But he did not see his client show this bitterness either, other than through innocent walks in Osku, perhaps looks exchanged that a local busybody picked up on with one of the Nojoumi brothers, or both of them, or Taheri. Not without embarrassment and misgivings, in veiled terms—but he understood perfectly—I took the risk of asking Sajjad, the son, who loved his murdered and allegedly cuckolded father unconditionally. And I sensed nothing there either—not the characteristic whiff of a hushed-up tragedy and a buried family secret; not, as is often the case, the obscure solidarity of the male with the humiliated male; not even, to tell the truth, the ghost of the inconstant mother one would end up forgiving, given the indefensible disproportion between the crime and the punishment. My feeling, in short, is that Sakineh may have fallen in love, but she probably never acted upon her sentiments. We may not know everything about Sakineh, but we know enough to fight for her. Nicolas Sarkozy told me during a recent phone conversation that Sakineh’s fate has become a “test” in which he will no longer give an inch. Why is this so? Why has public opinion the world over taken hold of her face and made of it a planetary icon—forcing the Iranians to recently suggest that perhaps she could be spared? It is not, I think, because of the injustice of her particular situation, although whatever way one examines the problem, she is eminently innocent; it is, rather, because of what Sakineh represents. She has become a symbol of all those other Iranian women: the shadows, the ghosts that stand behind her and, like her, have no other right than to go on, eyes downcast, encaged, suffocating in their prison of fabric, wordless, and, at the least step out of line, tortured. She has become a test of the world’s ability to resist the Iranian government’s cruelty toward women. And a test of the Iranians’ capacity to understand and to back down. Bernard-Henri Lévy is the author of Left in Dark Times: A Stand Against the New Barbarism. Translated from French by Janet Lisop. This article ran in the December 30, 2010, issue of the magazine.